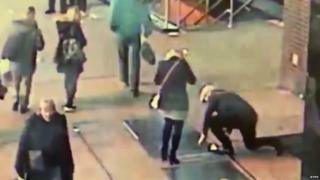 Police in New York have found the couple who got engaged in Times Square on Friday but lost the ring down a grate. The NYPD tweeted on Sunday that arrangements were being made to return the ring to the pair, who are from the UK. CCTV images showed the couple unsuccessfully trying to retrieve the piece of jewellery. But police officers later managed to rescue and clean it. The BBC has been in touch with the couple and understands they are from Peterborough, Cambridgeshire in the UK. They have been named by NYPD as John and Daniella, who said they had now returned home. The footage was taken just before midnight on Friday and was released by police shortly after. His fiancée, who police confirmed said "Yes", puts her hands to her face when she realises what has happened. The man then lies down on the floor by the grate, trying to reach the piece of jewellery but again they are unable to retrieve it. Officers from the New York Police Department clearly have a romantic side and, more importantly, access to the grate, so could get it out quite easily. Earlier, they had put out a plea for the man and woman to come forward. Later on Sunday they released an image of the cleaned-up ring on their Twitter account with the caption: "Here's a photo of the ring our officers recovered (and cleaned!) Call 1-800-577-TIPS or DM @NYPDTips if you know the happy couple so we can return it to them!" Well-wishers were quick respond on social media. One wrote: "I hope the couple is grate-ful."